A setting sun and the Columbia city lights give the Gervais Street Bridge a warm evening glow. 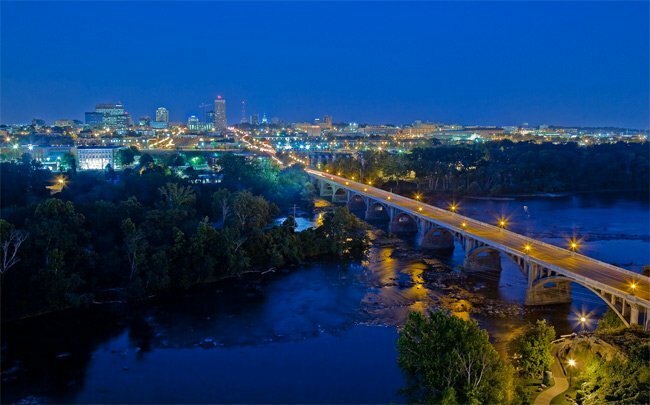 The Gervais Street Bridge connects West Columbia and with downtown Columbia by spanning the Congaree River. The ornamental bridge is instantly recognizable to anyone familiar with the Capital City. Several bridges have crossed these waters, the earliest being a toll bridge built here in 1791. 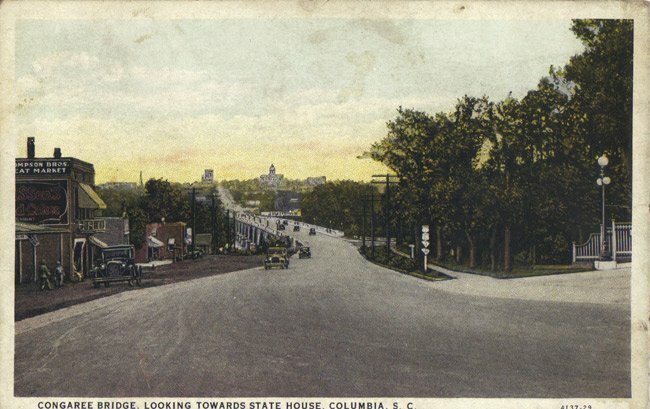 That bridge was replaced with a wooden bridge in 1827, which was burned by Confederate troops during the Civil War in order to forestall Union forces from entering the city. A new bridge was built in 1870, which was ultimately replaced with the current bridge. Construction on the bridge began in 1926, and it was completed in 1928. It was designed by Charleston engineer Joseph W. Barnwell. 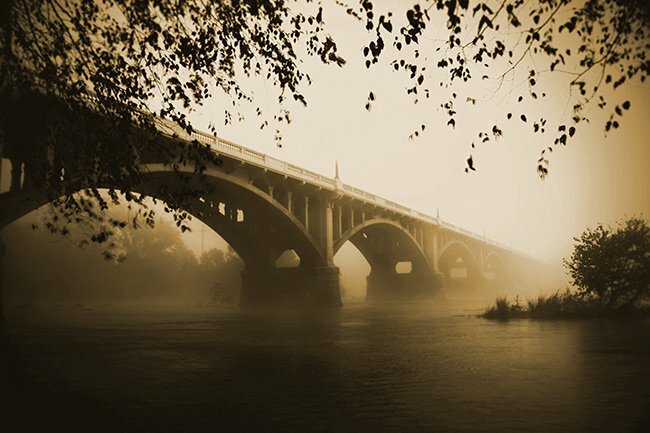 Until 1953, it was the only bridge that crossed the Congaree River. Today, several crossings take pedestrians and motorists over the river, though this bridge is the oldest. Above the railings on the bridge sit cast iron light fixtures. The decorative lights posts have a palmetto tree on their bases. On the octagonal posts there are vine patterns and an acanthus leaf, which stands for quality, longevity, and creativity. 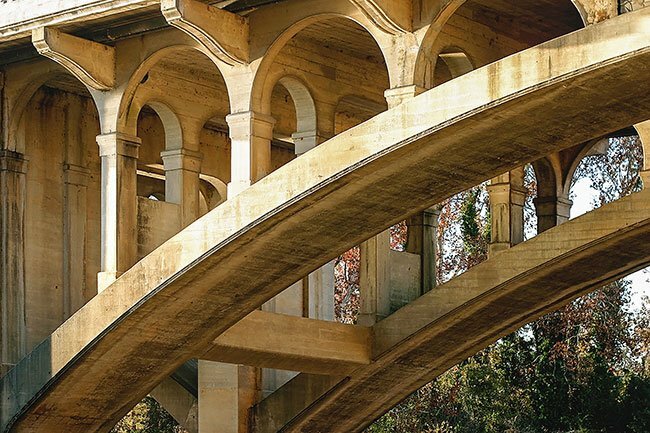 Despite the decorative detail on its railings, the Gervais Street Bridge is best known for its dramatic arches that span the river. Two closed spandrel arches anchor the bridge at either end, while nine open spandrel arches support the length of the bridge. 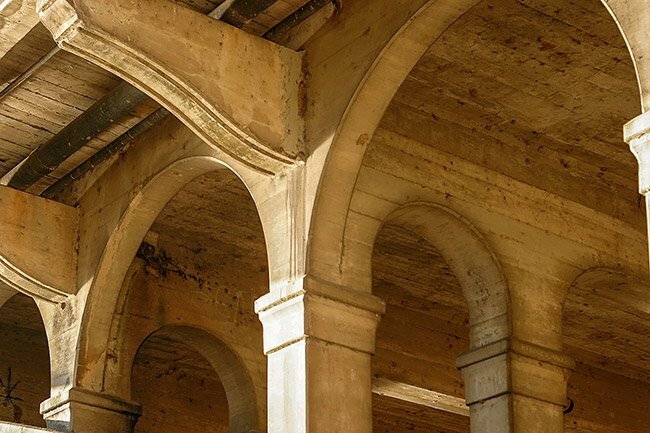 Spandrels are the spaces between arches and can be open or closed, or solid. 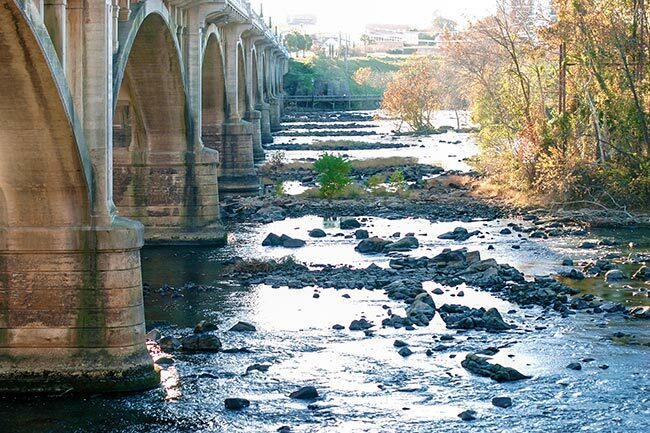 If you kayak the Congaree River near the Gervais Street Bridge, be on the lookout – it is thought that General Sherman and his troops dumped munitions into the river at this spot after burning the city. Excavators, under the guidance of explosives experts, plan to retrieve the relics over the next few years. Anything recovered will likely be kept in the Relic Room of the South Carolina State Museum. Tar also pollutes the river near the bridge. The tar was found by river guide Austin Bunn, and the discovery was announced in 2010. The sticky substance is the byproduct of coal gasification. It is believed to have been in the river for around 100 years and is slated to be removed by South Carolina Electric and Gas. 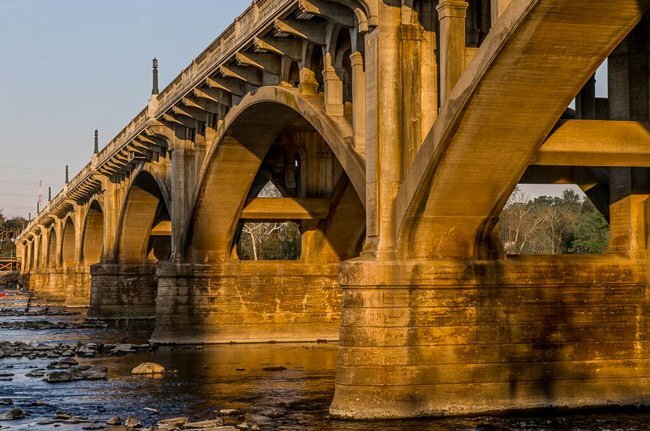 One of four open spandrel arch bridges of reinforced concrete in South Carolina, the Gervais Street Bridge spans the Congaree River and links Columbia to the western and southern parts of the state. At the time of its construction, begun in February 1926 and completed in June 1928, the bridge had the widest roadway in the state. 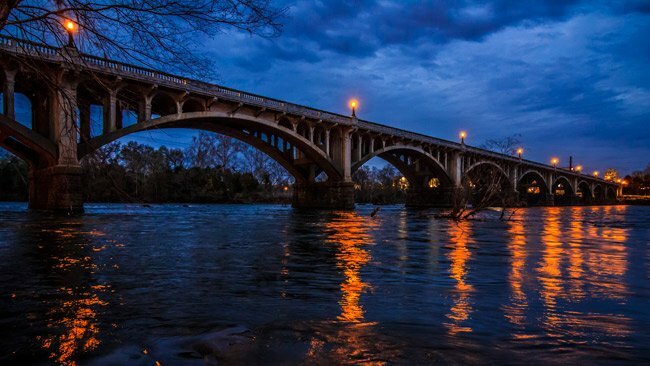 From 1928 until 1953, the Gervais Street Bridge was the only Columbia Congaree River bridge and is the earliest and most decorative of the three bridges that now cross the river. The site historically has served bridges and ferries. Ferry service was first replaced about 1791 by a toll bridge. A subsequent wooden bridge completed about 1827 was burned in 1865 to delay General W. T. Sherman’s army. 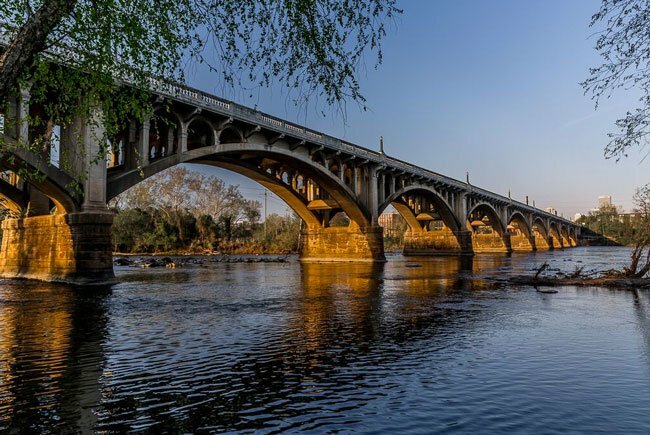 The rebuilt bridge was privately owned until 1912 when it was purchased by Richland County in cooperation with Lexington County. The 1415-foot reinforced concrete bridge was constructed by Hardaway Contracting Company of Columbus, Georgia. It cost $597,167 to construct. The bridge was designed by Joseph W. Barnwell of Charleston, bridge engineer for the State Highway Department. Above the flanking balustrades on the bridge are cast iron light fixtures. The decorative fixtures have the letter C and a palmetto on the bases, a vine pattern on the eight-sided post, and an acanthus leaf design on the necking. There is a tunnel at the end of the bridge to the right going into Columbia. Parts of it is a bricked arched tunnel dating back to mid- to late-1800s. I have pictures. We had a wedding not too long ago that wanted to have the reception anywhere downtown that would allow them to see the Gervais Street Bridge. Apparently they loved it, too. Hi, David. We suggest you contact someone with the City of Columbia regarding your concerns. Here is the website: https://www.columbiasc.net we are a private website that documents landmarks with photos and are not connected with any of our entries. Who would be in charge of removing the “construction” signs on the bridge sidewalk? There is no construction going on anywhere near the bridge. They have been up a very long time and the fact that they bolted to the sidewalk makes it that much worse. Seeing that the bridge is on the National Register of Historic Places, anything that deters from its beauty should be corrected. These signs need to be removed. Hello! Please tell me how to get down to this bridge to take a picture of it — thank you! This bridge is one of the most beautiful bridges I have ever seen in my life! These are both very beautiful! I’d like to submit a couple of my photographs of this bridge. I did not know the name of it when I shot it this past summer when visiting Columbia, SC. Both shots are very good. Like the processing in the second shot. This bridge is so beautiful, and I love walking the river walk to see its beauty.